Landscape design is an essential part of landscaping but it is landscape installation that is most critical in achieving a beautiful landscape! At Evergreen Landscape & Design, we take great care to do only the highest quality landscape installations. First and foremost we provide a safe working environment for our employees, the customer and the community. We hire only the most experienced craftsmen and provide ongoing training to keep our staff up to date with new products and installation techniques. Evergreen Landscape & Design is fully insured with liability insurance and workman’s compensations to protect our customers and our employees. Second we do not cut corners. Just because its faster doesn’t make it better. We do not have a knock it out and be done attitude. Everything we do from a landscape installation standpoint has a process and we follow the industry standards or we improve them. If we find we have somehow done something sub-standard, we do it over, or we replace it. Third, we communicate extensively with our customers as the landscape design is installed. We quickly address any concerns or problems if they arise during a project. We make suggestions and listen to customer’s suggestions during a project. We strive to maintain excellent communications between the installers, any sub contractors, the designer and the customer to ensure a timely and top quality installation. Fourth, we never cut corners on materials. We order the highest grade materials and if we find we have been delivered undesirable materials we replace them prior to installation. Finally, we complete our landscape installations paying very close attention to the final details. 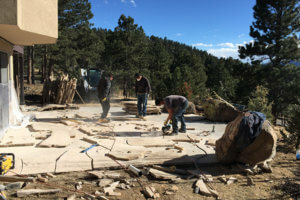 It is the final details of a landscape project that brings it all together and buttoning up the little details is critical to the final product. With any large project, it is natural to be tired at the end. We recognize this, but refuse to make any concessions at this critical stage. We will continue our focused efforts to the very end as we know it is the final details that are the most important. When we as installers can finally stand back and look at our work with pride, we will then do a final walk through with the customer. We won’t leave until the customer agrees that the project is complete and they are completely happy.